I was born in Jerusalem and spent most of my life in my hometown town of Maale Adummim. Between Jerusalem and the Dead Sea, on a limestone hill at the edge of the Judean mountains my perception of the world got its shape. After 18 years of preparations I’ve joined the army for a mandatory service of 3 years. I started my service as a paratrooper and followed my father’s footsteps and also my Grandfather’s, Kurt (Arie), who fled Austria to Israel after the Kristallnacht, was a British Brigades soldier during WWII and later served in the Israeli Army. In the fall of 2007, only 4 months after finishing my army service, I began my B.A studies in Photography, at Hadassah Academic College Jerusalem. After graduating in 2011 I moved to New York, where I worked as a security officer for the Israeli aviation for nearly 4 years. In the fall of 2012, and during my work at JFK airtport, I started an MFA in photography at the School of Visual Arts, which I graduated from in 2014. Ever since I can remember it was photographs who introduced me to and informed me of my personal and collective past or present realities that are inaccessible or out of reach. Photographs had visually mapped reality. A broken promise we made to ourselves looking up to the medium as a neutral reflection of what visibly exists. We treat photographs as hard evidence, and to the extent that we find ourselves considering what is real to be different from how it should be according to its own image. Since the inception of photography, reality gradually became augmented by its own reflection. I am focusing my work at this point of friction. Participating in this exhibition is your first involvement with the Wassaic Project. How did you hear about the Wassaic Project? It is actually hard not to know about the Wassaic Project. I first heard of it during my studies at the School of Visual Arts in 2012 and it was always praised by people who visited or participated. My dear friend Yael Eban participated in the Wassaic Project and it also sounded like quite a wonderful experience. You were born in Jerusalem where you spent most of your life before moving to New York City in 2011. What led you to become interested in photography as your medium of expression? Since I was a little kid I was curious about how pictures portrayed realities. Postcards never looked like the actual place, both ones of Jerusalem and ones of anywhere abroad. I remember always wanting to have the ability to take photographs that will make a better version of the world I was experiencing — that was a feeling that I carried with me until I actually studied photography in academic settings. I think I was somewhere between thinking that either the world did look great when the picture on a postcard was taken or that the photographer was really good. For myself I wanted to get the hyper photorealistic look — believable fantasy — I didn’t have a name for it at the age of nine where I remember myself shooting disposable cameras at a school field trip, but I was definitely imagining already then an image that will be an enhanced version of my experience of the moment. The contradictory nature of the medium of seemingly being a piece of evidence while always containing the potential for manipulating our perception of the real — this duality fits really well with my relationship with reality. Many of your photographs have a sense of an alternate or manipulated reality. There is often a dramatically still and mysterious quality to your work with an undercurrent of foreboding. What do you hope a viewer will take away from your photographs? I want them to be suspicious of everything they know. Maybe question how they came to realize certain thing they perceive real, obvious and granted. And the most important is to sense how much they are informed through the medium of photography. In the two photographs in this exhibition, the use of light seems to be critically staged and one wonders whether these scenes are real or have been created in miniature. Can you elaborate on the story behind both of the photographs and the miniature sculpture? The two framed prints, Chicago Urban Warfare Training Facility and The Flooded Room are both dollhouse scale models that I built and then photographed. They actually have a very strong relationship between themselves and the medium of photography. The Flooded Room was made after Hurricane Sandy. It was back then in October of 2012 when I was still new and very foreign to this country when the hurricane hit New York. I took my camera with me and walked south all the way from Forest Hills, Queens to the Rockaways. No trains, no buses, even taxis weren’t running as the fuel was depleting. I ended up not really taking pictures because I felt discouraged by the scale of devastation. What I did notice still was the piles of furniture out on the street that were left out to dry after many houses were flooded. I had no one to talk too and I felt out of place, so I never had the chance to see the houses from within. I decided to make a miniature of a flooded American house. I based the house on the sum of all American houses I had seen in my life — on television. I figured I had never been myself into an American home but I had pretty good idea of how one would look like from within. A year or so later I made Chicago Urban Warfare Training Facility — a concrete scale model of an Israeli army training facility for urban warfare. After explaining for a while the concept of The Flooded Room I realized that I had never been into another type of home, a Palestinian home. I was trying to think about the subject and remembered that during my military service we were training for urban combat in structures that were built to resemble common architecture in use by Palestinians. I realized that in the absence of a real experience my first encounter with a “Palestinian home” was an identical proxy under the context of enemy. I found a very interesting correlation between the two houses I never experienced myself, and my perception of America as my haven and Palestinian areas as enemy territory, and the relationship between reality, photography, and the imagined reality of the scale models. How much of what we know is shaped by second hand experiences and encounters with reality’s proxies? How much of our perception is based on our trust in photographs? Both miniatures were built and photographed in my rented apartment in Queens, New York. The dimmed light through a window after sunset with an Ikea spot LED lamp illuminating the staircase suited The Flooded Room, while a strong morning light simulated the desert blinding sun for Chicago Urban Warfare Training Facility. 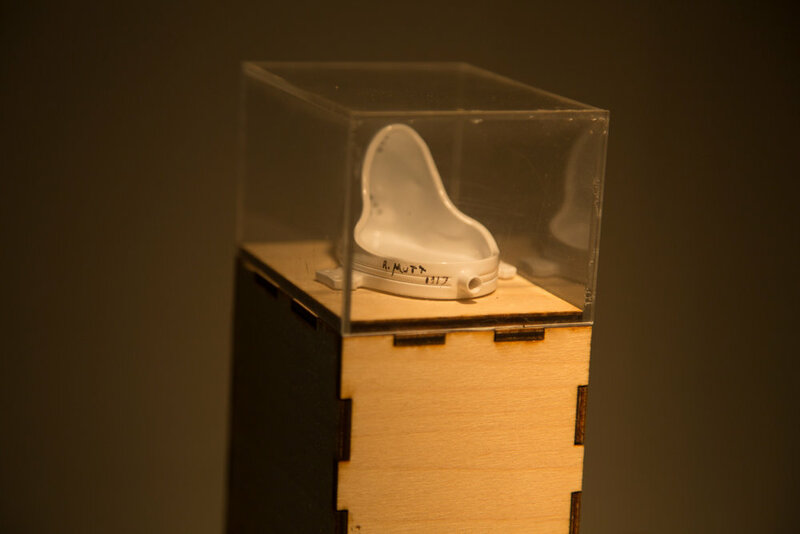 About the miniature sculpture: a hundred years after Marcel Duchamp went out and purchased a standard urinal, brought it back to his studio and signed it as "R Mutt 1917," I made this 3D printed hand painted and signed tribute. The gesture of taking a ready made object of everyday life, and specifically the humor behind choosing a urinal, and recontextualizing it and claiming artistic authorship by signing it was supposed to be a middle finger pointed at post WWII modern society. It is not clear to me whether the immediate and lasting success of Duchamp's Fountain marks the total failure of his initial intent or does it continually reinforce his claims regarding society. My own tribute revisits the fetishism of the "familiar recontextualized" in the aftermath of postmodernism that we live in. In my works I often look for second hand experiences like the ones supplied to us by images and anything our culture fetishizes — essentially the actual meaning is replaced by the surface layer which in turn is charged with new meanings remotely associated with the original intent. To make my miniature tribute I downloaded a readymade 3D file from an online library, then printed it using durable resin and painted it with a glossy white spray paint from Home Depot to give the appearance of a delicate porcelain object. The new scaled Fountain is still signed 1917 anachronistically — an appropriation of an already appropriated readymade object, a urinal that lost its function twice. While Duchamp's Fountain was aimed at the art world, my Fountain is aimed at anyone who immediately recognizes the former, as we all do, based on its fetishized popularity. This is the only miniature I ever made that was not created for a photograph, and therefore I have been reluctant to share its existence, so far, by showing a picture of it. The few people who did see a picture I made of it using my phone said they would love to have a miniature Fountain for their desk. For me it marks both the success and the failure of the piece — does it fit in a museum? Or in the museum's gift shop? The lack of a clear answer is exactly the meaning of this piece.